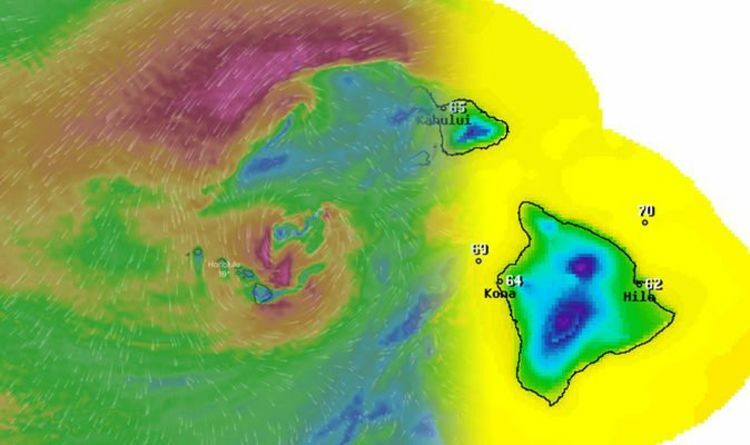 Hawaii's residents on the islands’ north shores were told to prepare for coastal flooding as a massive storm approached. Destruction across Oahu and neighbouring islands show the power of the storm, as trees were felled and high winds took down poles and power lines on the island. The public were warned to stay away from Oahu’s north and west shores because of massive storm surf washing over the road. Hirokazu Toiya, Honolulu Department of Emergency Management, said: “Pay attention to your surroundings and to the wave conditions. The Honolulu Star-Advertiser reported the Bayfront Highway on the Big Island was closed because of high surf and is set to remain closed until Wednesday. Gavin Shigesato, meteorologist with the National Weather Service, said waves near Waimea Bay on the north shore of Oahu surpassed 60 feet on Sunday. Surf heights reached a staggering 45 feet on other parts of the island as the storm hit. Debris caused by the storm closed down roads in downtown Honolulu and in the Waikiki area. Hawaii County Mayor Harry Kim tweeted all beach and state parks would be closed until further notice. Mayor Kim wrote: “The National Weather Service has issued a High Wind Warning for the Big Island. “Be aware that peak impacts for the peak impacts for the Big Island are anticipated to take place Sunday night/Monday morning. A gale warning is in effect until Monday morning for surrounding waters and channels. Two evacuation centres opened on Sunday morning in Oahu as officials told residents to monitor conditions. The Red Cross opened a shelter in Kauai on Saturday night. The Department of Land and Natural Resources reported snow at a state park today and Polipoli Spring State Recreation Area on Maui was blanketed in snow. Two grounds hornbill birds escaped from the Honolulu Zoo after a branch or tree fell on their enclosure.